Offering you a complete choice of products which include expansion joint waterproofing tape and aluminum foil butyl tape. Perma Expa Tape is available in Grey Colour its used for Expansion Joint Waterproofing. Its suitable for isolation joints, weak construction joints and joints between two dissimilar building materials such as concrete and stone work or concrete and steel/PVC pipes etc. Failed Expansion joints where in the sealant has failed either in or cohesion or adhesion, cause severe leakage problem in the buildings and these leakages start corroding reinforcing steel bringing down the life of the structure drastically. Similar phenomenon is observed in the joints of dissimilar building materials such as joints of concrete with steel/PVC pipes, junctions of RCC and stone slabs/blocks, many such junctions in sewage and water treatment plants, building roofs etc. Perma Expa Tape offers a permanent solution to these nagging problems. It not only water proofs these weak areas but also helps in maintaining their aesthetics and life of the structure. We offer Aluminum Foil Butyl Tape. Perma Aluminum Foil Butyl Tape is a single side butyle rubber adhesive tape with reinforced aluminium foil backing polynet and which is used for water proofing all joints in construction and post construction. Perma Butyl Tape SF 50 is used for covering all cracks, construction joints, bends and corners and joints of non homogenous materials before application of waterproof membranes such as Perma Guard or Perma Eazee Coat. Perma Butyl Tape SF 50 is used for joint sealing of the metallic and non metallic roofing such as aluminum, zinc asbestos sheeting. Perma Butyl Tape SF 50 can be used for sealing all joints in timber framed houses. It is used for sealing all the corner joints and the joints between the horizontal and vertical RCC surfaces of the sunken slabs of toilets and bathrooms after waterproofing. It is also used for covering of all cutouts and pipe joints in the walls. 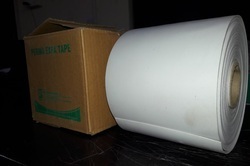 This tape is used for covering the insulated air conditioning ducts. Butyl Tape SF 50 is resistant to hot and cold temperatures. It withstands 90°C without yielding. Butyl Tape SF 50 is totally waterproof. It has good adhesion to all types of surfaces and can be painted over. 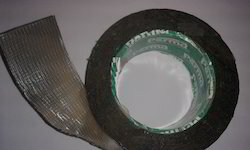 Perma Butyl Tape SF 50 comes in the form of a roll. The tape has an adhesive portion of black color which has nonwoven white polyester fabric on one side and a brown colored release paper on the other side. Pull out the release paper from one end and place the adhesive side of the tape onto the surface. Keep pressing the tape in position while pulling out the release paper. Looking for Waterproofing Tapes For Construction ?